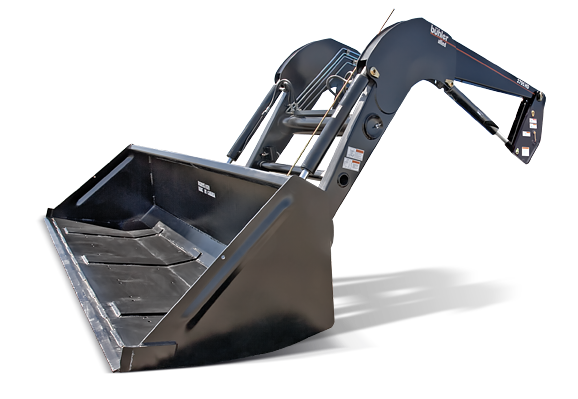 With one of the largest mounting kit application lists in the industry, there is an Allied front-end loader available for nearly every tractor, large or small, new or old. Custom colors are available to match all tractor brands which adds resale value and visual appeal. Earlier model tractors continue to use our time-proven 95 Series loader, for tractors with 15 to 275 hp. The conventional four-point mounting system includes two rear main "boots" and two front hooks that provide a positive lock to hold the loader tight and rigid to the loader mount. Most of our 95 Series mounting kits have rear axle bars that connect our mounting kits to the rear axle of the tractor providing increased strength and support. All of this minimizes stress on the loader, loader components and tractor frame to enhance longevity. Designed specifically for modern tractors, the Midmount 2000 Series provides enhanced visibility, increased lifting capability and superior breakout force. The Midmount 2000 Series provides easier access for service, more clearance for tractors with front wheel assist and extra room for front mounted fenders. Mechanical true self-leveling is available on models 2495 to 2895.